When you buy a property or build a house, you want to ensure that the outdoor spaces are just as well planned and beautifully designed as the rest of your home. However, this is never a matter of chance. It takes a certain amount of effort and time to ensure that the garden design and yard has the right elements and features. There are times when the grading of the land isn’t right and this leads to water pooling on the landscaping or near the foundation of the house which can end up causing damage The one solution is to level the land and clear slopes (if any), in the landscaping. However, when you do that, you also need to ensure that the soil and exposed rocks get the right amount of support. This is where retaining wall design comes into the picture. Various materials can be used in retaining wall design such as concrete, brick and natural stone. The latter could be set in mortar or dry-stacked stone walls too. While poured concrete can be used, it’s not an ideal option as it has a tendency to crack. We use modular concrete blocks (CMUs) or interlocking concrete blocks in this work as the construction is quicker and the walls are sturdy and long-lasting – a win-win for everybody. If you find that the concrete surfaces look too dull and drab, you can use stone or brick veneer to enhance them. This adds to the aesthetics of the retaining wall design. When we take up any retaining wall construction project, we discuss in detail what your preferences are and understand how you would like the design to look. 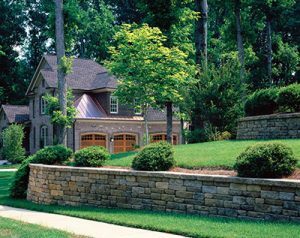 Some of our clients wonder how there can be any landscape design elements in retaining walls that are typically meant to be functional elements. However, options can include incorporating built-in seating or planter beds in the wall as this provides dual functionality and adds value to your investment. We focus on quality while being respectful of your budget when designing retaining walls. If you are looking for skilled and experienced retaining wall installers, Ivy Studio is the company to trust. Ivy Studio are the landscape design experts that provide comprehensive landscaping solutions to the greater Boston and Massachusetts Bay area. Get started on your landscape design project today to discuss having a custom retaining wall design installed, or take a look at the other landscape design services we offer.